This weekend, my family had the wonderful privilege of taking in Opening Night of a production of Feld Entertainment's Disney on Ice - Mickey & Minnie's Magical Journey. As a Feld Family Activator, we also had the delightful opportunity to meet a couple of VERY special folks before the show! This was Mickey and Minnie MOUSE! (Even though when we were walking in to the Meet & Greet - he saw them & said 'Hey! I remember those guys!' - CUTEST THING EVER!! Such a bummer...If they only knew how lucky they were right? Regardless - they were both super excited for the show...Who wouldn't be!?! 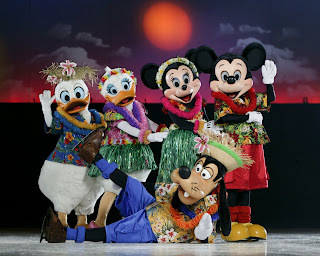 If you have a chance to take in Disney on Ice ~ Mickey & Minnie's Magical Journey - Do it! Metropolis Resort in Eau Claire Wisconsin! Read all about our adventures here! Christmas is just one big competition! From the Christmas cards, to the cookie exchanges, to shopping, and decorating-I can't take it! Come join us for a night of humor as we let off a little steam from the season. Rediscover what all of the fuss is about! This fantastic musical revue features seasoned performers: Heather and Jenna Gerard, and enough laughs to tone your stomach before that big family get together! This sounds like a pretty fun show at the New Hope Cinema Grill and tickets are just $15? What a fun evening out! How would you like two complimentary tickets to the show courtesy of BRAVO! Productions? Simply leave me a comment here telling me you favorite, or not-so-favorite, thing about the holiday. Guess who's going shopping for a new purse at CSN Stores? Have fun shopping...for you OR your kids! Happy Holidays from Gust Gab & CSNStores.com!